There’s something fun about the word bon bon, isn’t there? I mean, just say it: bon bon. It sounds fancy and delicious and all sorts of difficult to make. And while bon bons are, for sure, definitely fancy AND delicious… they’re not hard to make! 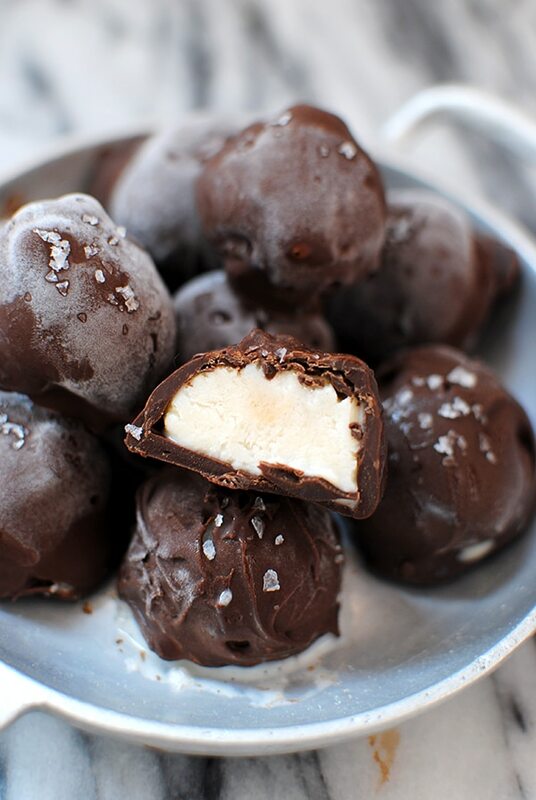 In fact, I’d never made these ice cream bon bons before this morning and now I have tons of them chilling in the freezer. I have been compensated by The Kroger Co. for this post, but the opinions are mine and mine alone. Keep reading for the Ice Cream Bon Bons recipe! The word Bon bon is a French phrase that originated around 1770 that translates literally to mean “good good” and refers to a coated confection. When I think of bonbons, I think of some sort of filling enrobed in chocolate. But, did you know bonbons don’t have to be coated in chocolate? Fondant apparently will do! I know. The horror. Let’s just set that nonsense to the side for now. To celebrate the launch of Low Cow Lite Ice Cream, exclusively available at Kroger, I wanted to make a treat that tastes indulgent, but that is actually pretty healthy. Since I’m working out six days a week and being pretty mindful of everything I eat between now and my birthday (I’ve got my eye on a particular dress in my closet), the launch of Low Cow and my fitness goals lined up quite nicely. Each pint of Low Cow Ice Cream has around 280 calories (for the whole pint!) and 24 grams of protein. This means I can keep the ice cream bon bons in my freezer and not worry about them undoing all my hard work. Yay! First, choose your flavor! Low Cow Ice Cream comes in six rich, creamy (but still surprisingly low calorie) flavors: Vanilla, Chocolate, Lemon Cake, Birthday Cake, Mint Chocolate Chip, and Sea Salt Caramel. 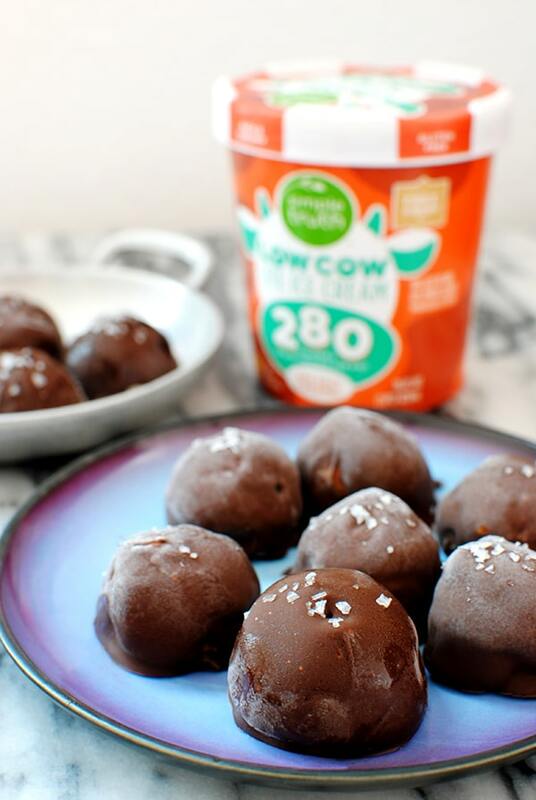 I love a good vanilla ice cream and I can’t say no to the combination of salt and caramel, so I made ice cream bon bons with both! Which reminds me… I also really need to add my Sea Salt Caramel recipe to Let’s Eat Cake! I might have also bought some other pints that I’m planning on trying some other flavors with soon! I think the birthday cake would be super delicious coated with white chocolate and sprinkles and the chocolate is sure to be undeniably good coated in peanut butter or melted peanut butter chips. 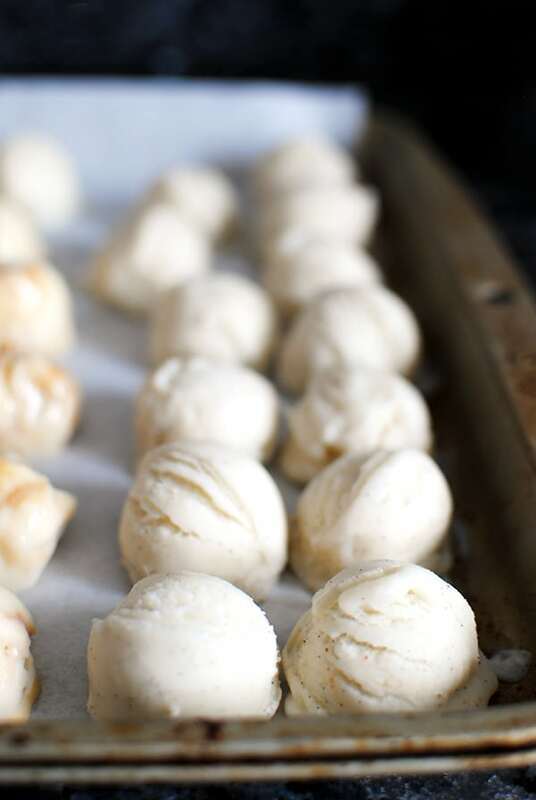 But, for now, here’s how to make Salted Caramel Ice Cream Bon Bons! Use a size 50 disher (or a tablespoon), scoop all the ice cream out from the pint container and onto a parchment-lined cookie sheet. Pop this in the freezer and freeze until solid. When the ice cream is totally frozen, melt 1/2 cup of dark chocolate chips with 1 Tbsp. of melted coconut oil in the microwave. Stir the mixture until it’s fully combined, then gently drop one of the ice cream balls into the chocolate mixture. Remove using a chocolate dipping fork (or a regular fork) and place on another parchment-lined baking sheet. Can you make these without coconut oil? Not really. I tried this, but found that the chocolate seized up after making just a few of the bon bons. I surmise this might be because one of the ingredients in Low Cow is water, and chocolate seizes up when it comes into contact with water. By using coconut oil as an emulsifier, the chocolate stays workable throughout the whole process. 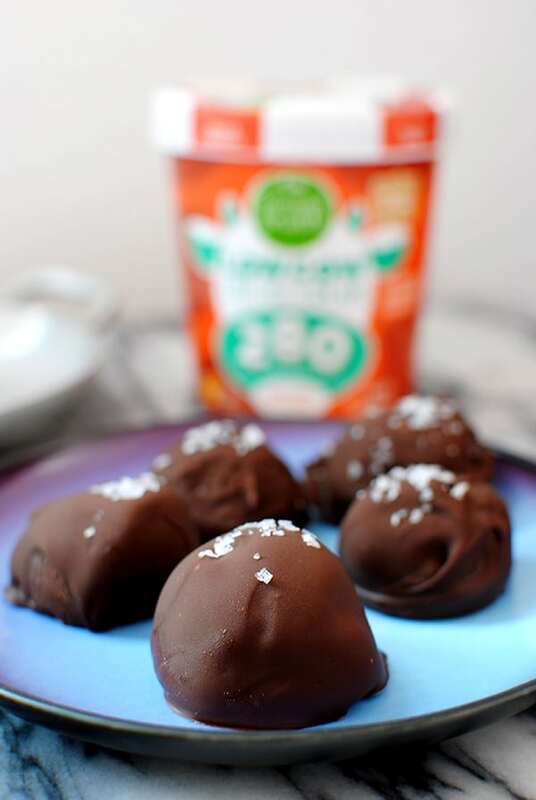 These ice cream bon bons are rich, creamy, delicious, and surprisingly low in calories! Use size 50 disher (or tablespoon) to scoop approximately 15 ice cream balls from entire pint of Low Cow Lite Ice Cream. Place each ball on parchment-lined cookie sheet. Place sheet in freezer. Freeze until solid. Heat chocolate chips and coconut oil in microwave for 1 minute. Stir until fully combined. Remove 3-4 ice cream balls from freezer and dip one at a time in chocolate mixture. Remove with chocolate dipping fork (or regular fork) and place on parchment-lined cookie sheet. Repeat with remaining ice cream. Place ice cream bon bons in freezer. Freeze until solid, then enjoy! Sea salt caramel? I’m in love. I’m going to have a look to see if I can find this ice cream. These would not last 10 minutes in my house. I would buy the dress in one size larger and just go to town on these! These look so fun and delicious! Perfect for these hot summer days! Bon bons were my favorite at the theater when I was a kid. 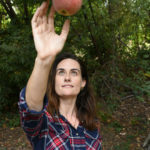 It is so fun to see your recipe and that they can be made at home and with less fats and calories. These Bon Bon’s look amazing and I will have to make them!